During an average day in my medical office, I recommend this memorable anti-inflammatory tool I call the “Rule of Twos”. This rule is especially beneficial for my patients with the “shuns” – inflammation, indigestion, and constipation. Take twice the time to dine. Grazing, or eating frequent mini-meals throughout the day, will help you implement the Rule of Twos. Studies have shown that people who eat frequent mini-meals throughout the day tend to consume fewer calories but are just as satisfied as those who eat larger meals less frequently. Think of your body as a giant biochemical orchestra and each hormone as a player. When all the hormones, especially the inflammation hormones, are in balance, beautiful music, or wellness, results. When the hormones are out of balance – meaning one plays too loud, another plays too soft, or one plays too strong for too long – your body is in inflammation imbalance, or illness. Grazing gives you stable insulin levels – the three magic words of hormonal harmony. Think of insulin as the master conductor of your hormonal symphony. When your insulin is stable (“on key”), the rest of the inflammation players in your orchestra are in hormonal harmony and your body plays beautiful music. Your body is in balance! Follow the Rule of Twos! Low blood sugar, which can trigger nausea, can occur upon awakening or anytime you go many hours without food. The traditional eating pattern of three square meals a day is not meant for pregnant women. A more digestible pattern is six smaller meals, which can be especially helpful when your stomach thinks it doesn’t want anything at all. Grazing on nutritious snacks throughout the day keeps your stomach satisfied and your blood sugar steady. You may find that this is a biologically ideal way to nourish yourself even when you aren’t pregnant. Once I started craving quality foods, I noticed I was satisfied with less. After a lifetime of acting like Templeton the rat, a chronic overeater, I was amazed by this change. Why was my belly brain telling me to eat less? Calorie restriction. 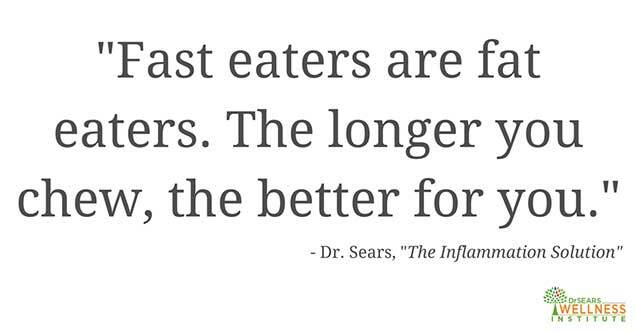 There is a huge amount of research attesting to the fact that people who eat less live longer and healthier. I didn’t want to be known as a calorie restrictor, yet it made sense: eating less means less food to metabolize, less “oxidation” (or wear and tear on the body), and healthier aging. It’s a simple concept, I theorized – and found scientific support in studies on calorie restriction – that the body becomes more efficient with less food. It is sort of like trading in your gas-guzzling SUV for a hybrid or getting a tune-up. You burn less fuel, produce less exhaust, and your engine lasts longer.